Daisy Trio Assortment 15% OFF! Assorted Whites 15% OFF! Multi Mix..7-10mm 15% OFF! Assortment..8-10mm..Opaques 15% OFF! All of our millefiori is coe 104. 15% OFF! Factory mix of opaque patterns, most not available individually. Assorted Circles 15% OFF! Flower..75..6-7mm 15% OFF! Flower..U38..6-7mm 15% OFF! Flower..U15..6-7mm 15% OFF! Yellow/clear. This is a darker yellow, not lemon. Flower..T57..7-8mm 15% OFF! Flower..U32..7-8mm 15% OFF! Flower..T82..8-10mm 15% OFF! Circle..133..8-10mm 15% OFF! Circle..S46..8-10mm 15% OFF! Flower..U56..8-10mm 15% OFF! Assorted Purple Stained Glass 15% OFF! Assorted Light Blue Stained Glass 15% off! No exchanges, no returns. 15% OFF! Assorted Blue Stained Glass 15% OFF! Assorted Pink Stained Glass 15% OFF! Assorted Green Stained Glass 15% OFF! 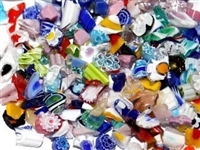 Oceana Glass...Assorted Pieces 15 % OFF! As assortment of large pieces, not chips, of mottled Tiffany style handrolled glass in a variety of dramatic 2 to 3 color combinations with wispy backgrounds that produce unusual yet beautiful 3-dimentional effects. This assortment will not have the larger pieces as found in the bags of individual colors. Assorted Stained Glass 15% OFF! Assorted Imperfect Mille..40% OFF! Complex Cane, Ends & Culls..50% OFF Assorted Rods 15% OFF! This assortment of broken, chipped, cracked, or otherwise imperfect millefiori is perfect for fusing, testing your kiln, or for mosaics. We have culled millefiori from our recent shipments from Murano, Italy. Prices are 40% off our assortment prices. Mosaicstone Colorants 1/2" Tie Dye Tiles..Assorted..25% OFF! Assorted Smalti..25% OFF! Mixed Bag of Tie Dye Tiles..25% OFF! 1 set of each of our 10 colors $46.00! A mix of all of our smaller glossy Tie Dye Tiles. 8mm x 8mm x 4mm. Does NOT include iridescent tiles. There is not an equal mix of colors due to hand mixing. These tiles are a perfect match for 7-8mm or 8-10mm millefiori. Not for fusing. Tie Dye Tiles..Mixed Iridescents..25% OFF! Coarse Opaque Mille Frit..15% OFF! Coarse Transparent Mille Frit..15% OFF! Assorted Black-Grey Cheeky Fusions...20% OFF! A mix of all of our glossy Iridescent Tie Dye Tiles. This is a mix of small and medium fusions.